Amsterdam Deventer Windmill A "mushroom"
Holland is known as the country where everybody travels by bicycle (fiets in Dutch) starting with the Queen on down. And in fact, biking through the Dutch lowlands one will encounter more cyclists than in any other country. Also worth noting, in the extreme north are the islands of cyclists Vlieland and Schiermonnikoog. The network of bike paths (fietspad in Dutch), almost totally of asphalt or otherwise paved, is very comprehensive and well-signed. I have traveled bike paths that are perfectly paved next to country roads that are poor quality dirt roads. For once bicycles are treated better than motor vehicles. And Amsterdam is known as the most cyclable city in the world. In brief, bike routes seem inspired by a somewhat different philosophy from that prevalent in Germany and Austria; there the cyclist has dedicated routes or shared roads at the lowest level of traffic, often on unpaved roads, sometimes sharing a path with pedestrians, and when crossing through towns is often directed along sidewalks; here [in Holland] the cyclist can bike almost everywhere on an asphalt or paved surface, but often one finds oneself sharing the route with cars and motorcycles. 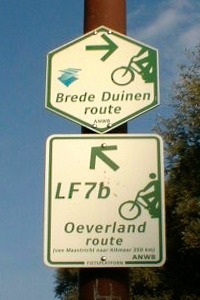 Routes are well defined by white and red kiosks and by white and green trail signs (see photo) dedicated to a specific route, and low, odd looking red and white distance markers (see photo) that the Dutch call paddestoelen [mushrooms]. All these signs are numbered with a number that corresponds to the primary cycling map: a simple and yet important idea that answers the age-old question of the cyclotourist “now where am I?”. The Fietskaart van Nederland [bike map of the Netherlands], in 2 sections, is perhaps the best of the Dutch cycling maps at a larger overview. More detailed maps can be acquired directly from the office of tourism (VVV). A complete list of bike routes can be found on the website Landelijk Fietsplatform (in Dutch). Itinerari in Olanda [routes within Holland] published by FIAB. Holland.com official site of the Dutch tourist agency.